Decades of research shows that expanding roads doesn’t provide lasting congestion relief. More lanes means more traffic. Would you like safer connections between Brighton Park, McKinley Park, Bridgeport and Pilsen, as well as better opportunities to bike, walk and take public transit in these communities? If you’re passionate about these issues, we need you to help us fight for this vision by registering for a leadership training 6-7:30 p.m. on Sept 27 at the YMCA in Pilsen — located at 2700 S. Western Ave.
Click here to sign up for the Sept. 27 leadership workshop. This workshop will cover skills and strategies for promoting walking, biking, and public transit in your neighborhood. Topics will include campaign planning, grassroots organizing, strategic communications and advocacy with decisionmakers. This workshop will be a great way to take action and shape the future of biking, walking and transit on the Southwest Side. Some of the challenges to active transportation that we’ve observed from leading walk audits in these areas include a high volume of semi-trucks, wide streets with fast-moving cars, faded crosswalks and narrow sidewalks, bike lanes that end abruptly and industrial land use along the Chicago River. Following the training, you’ll be well-equipped to engage residents, stakeholders and decisionmakers in campaigns that make it easier to bike, walk and take public transit. We’ll provide you with ongoing support by offering networking, technical assistance and skill-building opportunities through the Chicago Leadership Network. 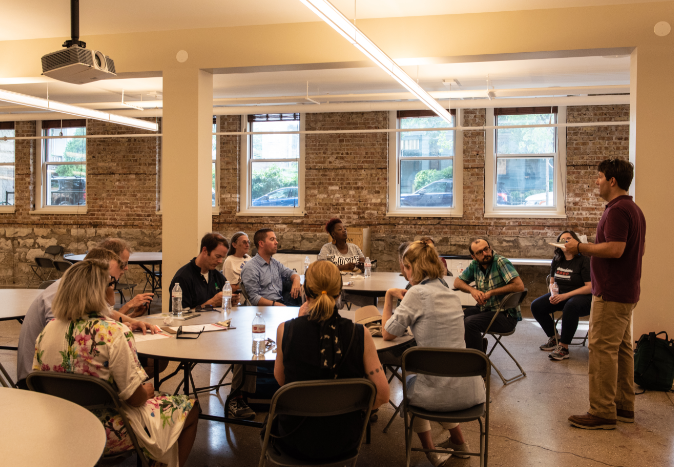 This workshop is part of our campaign for a continuous Chicago River Trail, which features a project to develop a community vision for a revitalized riverfront, including a trail along the South Branch. Sign up to attend the South Branch leadership workshop in Pilsen.